Las Vegas is a popular choice for conventions looking for a pleasant venue. It’s not that surprising that a conclave of heavily armed monster-hunters might choose Las Vegas for their gathering. Given how small America’s monster-killer community appears to be, it is not all that surprising that some of them know Ben, who was connected to the community via his close friend Cormac (currently doing time for murder). Most monster-hunters are unwilling to entertain the hypothesis that not all supernatural beings are monsters in need of immediate execution, so it is just as well that Ben’s friends do not know that he transformed into a werewolf several books ago. Kitty is a celebrity, so she does not enjoy Ben’s obscurity; who and what she is are the stuff of tabloid headlines. Awkward. Most monster-hunters prefer to (or at least pretend to) limit themselves to supernatural targets who are active threats. There are exceptions. Two such, Boris and Sylvia, are at the convention. They are keen on the idea of murdering such a famous werewolf as Kitty. And then there’s the genuine ancient cult hidden in plain sight amongst all the tacky fake pyramids. They also know who Kitty is. They have a use for someone like her or Ben and it’s not one that can be survived. The Kitty Norville books are ongoing argument against vacations (or visiting Denver). Any time Kitty goes somewhere new, someone tries to kill her or lock her in a cage. Or lock her in a cage and then kill her. Her perils remind me of the old Canadian radio show Nightfall, in which travel outside of the big cities was an invitation to a horrific death. The monster-hunters are a collection of racists who’ve found a way to get away with murder . Boris and Sylvia are just extreme examples. Ben claims to have been merely a peripheral member of the community. Still … I am a bit surprised that “former member of a community dedicated to killing people like Kitty” was not an insurmountable barrier for romance. Ah, well. Kitty manages to be pals with Cormac, who is an unrepentant monster-hunter. Kitty’s dubious taste in beaus aside, it’s a bit distressing to see that the author is increasingly setting her novels in a world of quiet vigilantism, a world in which the police are manipulated into arresting bad people who the reader knows are innocent of the specific crimes for which they have been framed. Kitty is an engaging character, but I preferred the earlier Kitty, still a believer in a nation of law, rather than the one who is beginning to set all that aside. 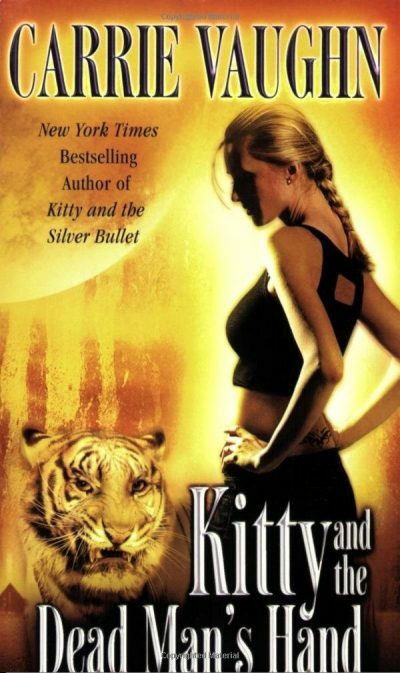 Kitty and the Dead Man’s Hand is available here (Amazon) and here (Chapters-Indigo). 1: One wonders to what degree the monster-hunters are manipulated by the craftier supernaturals, the vampires and such, into removing the vampires’ enemies and rivals for them. Regarding footnote 1, when Charles Stross introduced vampires into The Laundry series, they came with exactly that sort of vampire hunter attached.